Ihave news!!! I have located Charmaine, after months of traipsing through the internet, following up sightings of her peculiar take on the ancient art of calligraphy, I have located her on a cryptic crossword site run by my cousin Windsor (a right Batarde!). She is masquerading as some sort of genius and giving out clues to fiendishly difficult crosswords like jelly babies. She is also appearing in pantomime as Cinderella at the end of Wigan pier. I have sent her a letter urging her to return home soon as, with the promise of improved living conditions and use of the black and white telly on Sundays. I have also signed her up for some proper modern calligraphy lessons in London, which I hope she will review for us here. I am sure she will find this offer irresistible as she has had her eye on my black and white telly for some time now. Meanwhile, there is no news of Harold. 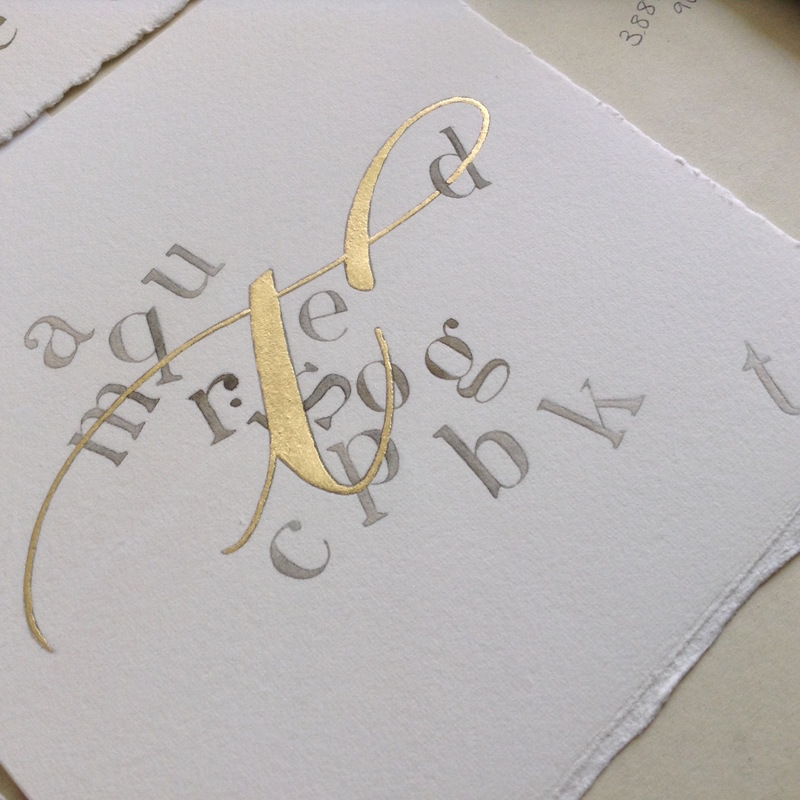 And here is some calligraphy related stuff…. 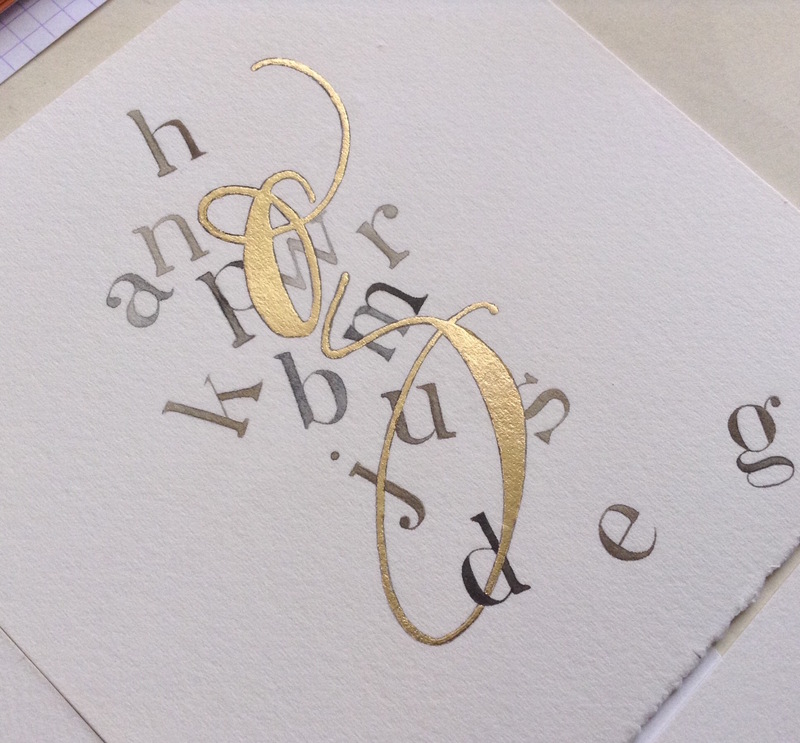 My resolution for 2016 is to glue more 23 carat gold on paper in a meaningful way. Happy New Year!!!!!!! I will be pissed later and will probably making gruesome advances to all and sundry – apologies in advance. This entry was posted in Calligraphy and tagged calligraphy uk, Charmaine, gilded letters, happy new year, modern calligraphy on December 31, 2015 by Scarlet. Hooray! Charmaine has turned up. I expect her Cindarella gig came about when Wigan suddenly had enough water to*have* a pier.Dear heaven! She’ll be a right little Miss Famous now.Bet she’ll insist on the big, colour telly! But I’m glad you’ve found the little minx because it’s been a bit dull without you. So here’s to things being brighter and better for you with more time to do your own thing. It seems that Charmaine is far more popular than I!! I am a little hurt by this…. but being made a Dame, an’all, has asurged my pain, bitterness, general angst, just a smidgen. Are you in the new year already? Is it good? Congratulations on finding Young Charmaine, but most of all that The Queen, has finally recognised your talent and given you a Damehood!!! If the likes of Joan Collins and Shirley Bassey can get one that why not you? One word of advice, if you are intending on upgrading the TV from black and white to colour- then I would get that whippersnapper Charmaine to pay for the licence, that is the least that she can do after causing all that distress!! Welcome back Dame Scarlet, I hold aloft my glass of Harvey’s Bristol Cream (located at the back of the larder and outdated by a couple of years)😂😂. As you can see, the demon drink has got to me- I have posted my reply twice!! I have sorted it out my end! Hello and Welcome, Ms Meta! Indeed, you are correct! I will demand compensation from Charmaine for running rings around me this past few months…. I have had my eye on a handbag…. and shoes…. which I will need for my trip to the palace. Have a wonderful evening and a very Happy New Year!!! I am new here (found your blog via Instagram) and unfamiliar with Charmaine’s escapades but I just want to say: That’s the best gilding ever done. Most gilding makes me feel like I’ve had too much cheap chocolate. This gilding is a small piece of gourmet chocolate followed by a swig of coffee. Five thumbs up! That’s one of the nicest things anyone’s said about my work! 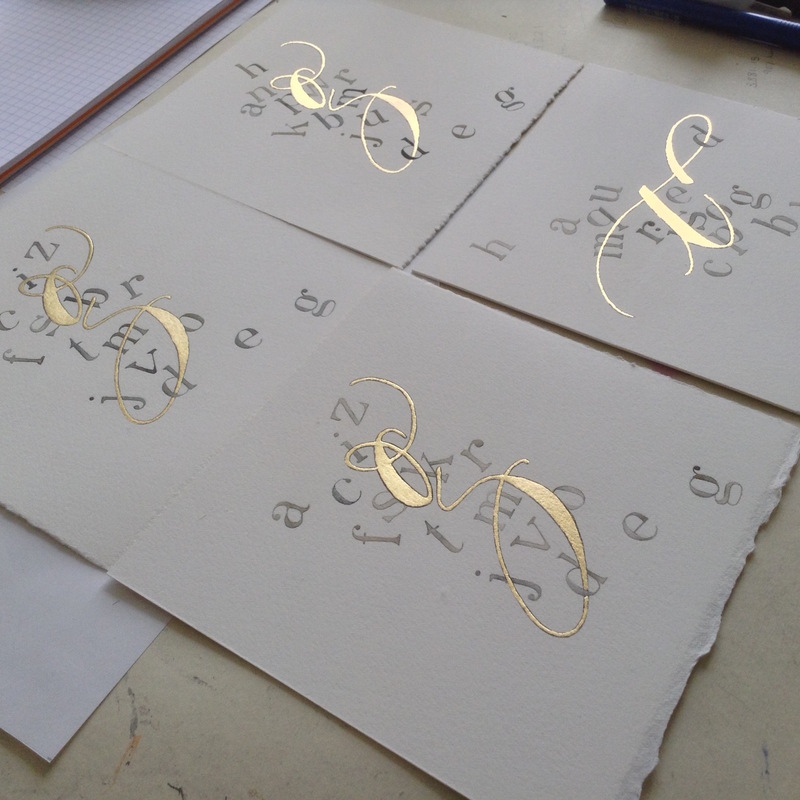 I am determined to do some raised gilding soon…. which is possibly where it’ll all go wrong!! Please hang around and you will grow accustomed to the variety of characters that inhabit this blog…. after a while it will seem normal 😊. Looking forward to it so much! Congrats on locating Charmaine! Perhaps her fiendishly difficult crosswords are in ROT13??? DON’T START ALL THAT AGAIN!!!! Charmaine is obviously brighter than I. Happy New Year Dame Scarlet! And what fantastic news to start the year off with. May 2016 be a year free from code!! Nothing coded here…. I just liked messing with the ‘d’. Will you soon be guilding lillies? Happy New Year, Ms Prinny!!!! Ha…. you seem to have found the code! Charmaine seems to be in demand wherever she goes…. she turned down a part in Downton to appear in that pantomime. Overjoyed to hear at last of your Damehood. About time too, you’ve obviously been Dame material for many years. I was offered a Knighthood for Services to Blogging but I had to turn it down as clearly it would be most unfair to those other humble scribes whose sterling work hasn’t yet been recognised. Do post pics of your visit to the Palace. I expect at the very least a shockingly revealing barely-there figure-hugging lacy sheath and challenging six inch heels. Yes, exciting times! Dame Scarlet has a certain ring about it. Take the knighthood…. after all it’s a day out and you get to wear a hat. Have a happy and preposterous New Year Scarlet. Lovely lettering, that’s beans on toast with an egg on top! Happy New Year, Ms Carte!!! May we always have eggs on top!!! Scotch, Irish, Gin…. you’ve got to love ’em, Mr Maps! Happy belated New Year darling! Happy New Year, Ms Roses!! Let’s make it a good one!!! You are an artist, and those gold caressed dancing letters on dream clouds are ethereal creations! They look very beautiful & carefree & exuberant! Very awesome! Happy New Year to you & yours! You’re not just a dame, you’re the Grandest Divine Dame of all! You are an artist, and your gold caressed floating letters on dream clouds are such magnificent & exuberant creations! They are absolutely beautiful & ethereal & stunning! You’re more than a dame. You’re the Grandest Divine Dame of all! Apologies, Mr Swings…. my approval system is stupid and didn’t recognise a gentleman when it saw one. I will keep both your comments because they are heartfelt and generous. There is nothing like a Dame! I feel like breaking out in song this morning! Happy New Year, Ponita!!! You have some really nice gs there ! It’s the third of January, the year is still fresh and squeaking from all that spanking – it’s not too late to wish you all the best for this New Year ! Indeed! No tarnish on this year yet! Happy New Year, Mr Mags! Must be an old telly. I don’t think you could find a new telly that was black and white. The gold on the paper looks regal. Hope your gruesome advances advanced things for you. My gruesome advances fell on deaf grue, Bill!! Isn’t that always the way? Life was so much simpler in Black and White…. never had to worry about clashing curtains with the sofa cover. Happy New Year, Jon!!! Good to see you!! How lovely to see a new post from you. Being slightly pissed later is always a good thing to look forward to so I hope you had a brilliant new year’s celebration. Happy New Year, Mr Ducks!!! I hope you had a good one too! So many colloquialisms! Batarde! Jelly baby! Wigan pier! And that’s just the first paragraph alone. I love the flavo(u)r. Happy New Year, you little minx. Monsieur Pain, have you never bitten the head off a jelly baby???? Happy New Year, my lovely!! I don’t *think* I have. Is it contagious? I think you ought to. You can dunk them as well 🙂 Not contagious, but possibly addictive. Jelly Baby Mash is quite the delicacy around these parts. Just pop a few Jelly Babies in with your mash (not Smash) for an unusual and decadent side! I do the deluxe version, Mr Devine, and add Smarties. Have you found Harold yet? Hello, Ms Fanny! Ah…. this Latino man – his name doesn’t happen to be Harold, does it? Have a wonderful finger flexing New Year!!! Hello darling, I’m ba-hack ! How’s the spanking going these days ? Helloooo…. !!! It’s flipping Wednesday today isn’t it??? Where does the time go??? I meant to post on Monday. Will try to have something up soon… maybe a banner or some pretty bunting….